New Years Resolutions are slowly fading away; I know that I am guilty of choosing multiple resolutions and not sticking to them. After March I even forget what I chose as my resolution – Heavens to Betsy! In better news, I think I have a solution to this problem. Let’s choose a 2016 Biz Word. What do you wish to accomplish in your biz this year? What word do you want your business to represent? Here is a little list of some short and sweet, yet powerful words that could be a great choice for your 2016 Biz Word. Do any of these tickle your fancy? My 2016 plan is to focus on my goals, my clients, my business, my to-do-lists, the amazing people around me, and a whole lot more. It is easy to get distracted and this year I am going to just simply focus. I am super excited to start implementing my 2016 word! In case you can’t tell yet, my 2016 Biz Word is focus! 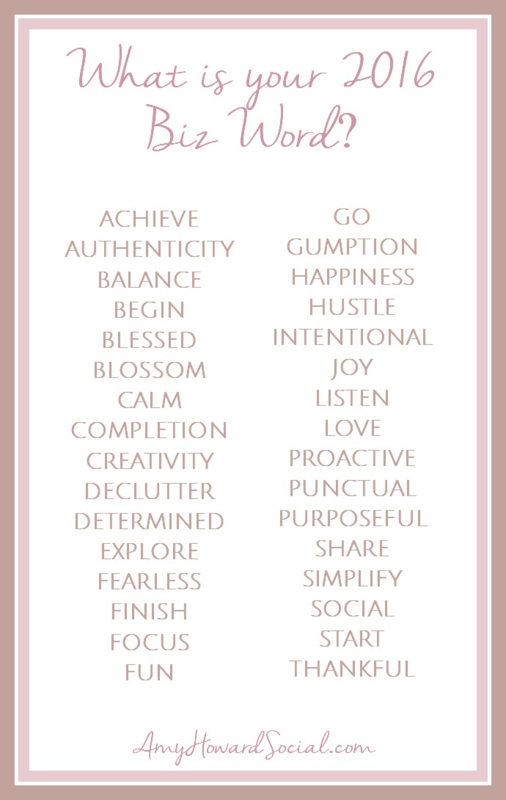 I hope that this little list of powerful words have helped you decide on your 2016 Biz Word. I would love to know what word you have decided on and why – comment below and let’s chat about our goals for 2016. I wish you all a blessed 2016! My word for 2016 is focus. Happy new year! Blossom – that’s a great biz word! Thank you for sharing!